Photos and key takeaways from last week’s Work Design TALK at Rocket Fuel in Chicago. Rocket Fuel’s Chicago office. Image courtesy of Rocket Fuel. The workplace continues to evolve rapidly and flexibility drives many organizations when it comes to decisions about their workplace. Last week at the Rocket Fuel office in Chicago, we probed industry leaders on the topic, including Elissa Beckman, head of talent and HR at SpotHero, Charles Hardy, chief workplace officer for GSA, Steve Teubner, principal at FOX Architects, and Randy Tritz, partner at Shen Milsom & Wilke. Each of the panelists recognized that most organizations are realizing that the connection between workplace satisfaction and productivity is very important and the choices available are critical to an organization’s success. Michelle Weiss, our associate publisher, waits to greet guests at Rocket Fuel. Photo by Mike Kozuchowski. Kate North of PlaceValue moderated the discussion and kicked it off by setting the context surrounding choice. Examples included getting work done and how technology is enabling and supporting the choices that we have. Today we can choose when we work (selecting the times of the day when we are most productive or more easily accommodating other schedules), and where we work (at our office, home, coworking space, or a café). Even within the modern office, we have a tremendous number of places to choose where we work and the amount of interaction that we desire. We can also choose how we work: there’s a growing spectrum of the tools that we use for concentrating or collaborating that becomes an important consideration. Is it virtual or face-to-face? High tech or low tech? We all recognize the importance of choice and its rising influence on our work and our work environments. As we venture into the infinite array of possibilities, the adoption and challenges that we experience associated with choice can range from easy to frustratingly complex. The panel addressed this variety of issues and range of possibilities. Kate North, center, the moderator, and Bob Fox, right, our founder, chat with a guest. Photo by Mike Kozuchowski. Beckman, who is working for her fourth startup (SpotHero), is passionate about how organizations grow; she described choice as a key element in the startup world. SpotHero embraces flexible work hours, and people can choose any time of the day to work. The important thing, she said, is that employees feel able to “get their work done”. People can also choose a variety of different spaces to work, either in the office or in another office at another location, when appropriate. 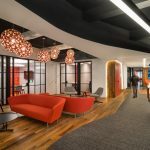 SpotHero’s workplace is open and casual, and they provide a variety of furniture, from beanbag chairs and couches to benching and private phone booths. The bottom line is that people must be comfortable. There is a genuine feeling that the company takes this very seriously and it’s part of the culture of the organization. She emphasized how competitive ecruiting for top tech talent can be. One of the big challenges is just getting them in the door and seeing how people live in SpotHero. Once they are in the space, they can see the values and the priorities of the company and how they support their people. Hardy addressed GSA’s perspective as being somewhere in the middle, offering some choice, but perhaps not as much as a SpotHero. He introduced the concept of “curated choice” where GSA is providing workplace options with specific intentions and that the choice must be thoughtful and intentional. He described a probation office that looked more like a hotel lobby and the experience surrounding how that choice evolved. Most of the people working there didn’t know what choice was and had little understanding of the concept. The journey was about understanding the needs of people. The officers were bringing ex-convicts on probation into their personal space with family images and personal information. Security was a concern, but the issue was raised that they felt they had no choice. Once they realized that providing a safe and secure choice could improve working conditions, it opened the door for a better understanding of employee needs. The experience for the people on probation was different, as well. The space was on the 34th floor of a large office building — a place where most had never been before. Meeting in the basement of an old building is much more common. When they entered they were in a completely different environment and they started acting differently, they realized that space really does affect our behavior. He mentioned that you can’t let the slow adopters hold them back. GSA’s recent 1800 F Street transformation was about choice and looking to the next generation of workplace. They created pilots to see and model the behavior to start seeing new things. They included reservation systems so people can appreciate unassigned space and the additional choices. What was important was providing the opportunity and the feedback loop so that there was a constant learning and improving of what works. Tritz brought to light how technology is second nature today, but was stifling and confusing as little as five years ago. It has enabled people to do work where they want, when they want, and with whom. We couldn’t do that five years ago. People like to work with other people, he said. There is an interesting thing about new technology: we like to show it off and we like to share our ideas and lessons on how to use it. We like to figure those things out in a collaborative environment. We want to share with others what we know and in turn we get new information back — a collaborative loop takes place. The technology enables that to happen and provides additional choices like when, how, and where. Another interesting change is that we can work anywhere and now our personalities come with us. We can work on any device and it’s pretty much just like the laptop sitting on your desk, but you could be in another part of the world. We can continue to work as if we were sitting in our office. The challenge is that we do not always have the ability to disconnect. We are hooked. Our phone buzzes, and it is a conditioned reflex: we respond. The panelists, from left to right: Randy Tritz, Chuck Hardy, Kate North (moderator), Steve Teubner, and Elissa Beckman. Photo by Mike Kozuchowski. Teubner asked the questions, “Why do we enable choice?” and “Why do we create space that is attractive?” It’s because we want to be productive and profitable, he said. It used to be that the input was the raw material. Now with technology, everyone has access and the ability to contribute. Technology is the great differentiator. Now it’s all about what you do with it and what your people can do with it. It’s about productivity. The first choice is about identity. Most young people want to join an organization that they identify with. When we start creating these places, we start to create a strong brand. That brand must be authentic and accurately represent the organization. Organizations that have strong identities understand that people and organizations must be aligned. There is a lot of beautiful space out there that people do not use. It is often uncomfortable to sit in for one reason or another. But if we help people and organization to better identify and communicate their brand and values, better alignment is possible. Everyone will do better if they are doing something that they like to do, he added. You’ve got to allow your people the ability to choose to be associated with a group that they like to work with; to gravitate to the teams where there is synergy. In the past, the workspace was always the end. Now it’s just a means to the end: what is important now and what really matters are the organizational dynamics. The median age in many tech organizations is very young, they have no issues using technology, but if they don’t have the newest or latest thing they won’t appreciate the workplace. Most organizations need to engage their staff in the types of choices and understand how different age groups embrace it and use it. With more choice, there’s an increased need for communication. Communication policies must be aligned, and, especially at high growth companies, communication is very important. Thanks again to our sponsors for making the evening possible! AgilQuest, Skender, Shaw Contract Group, Allsteel, HNI One, PlaceValue, Rocket Fuel, Partners by Design, and Workplace Evolutionaries.